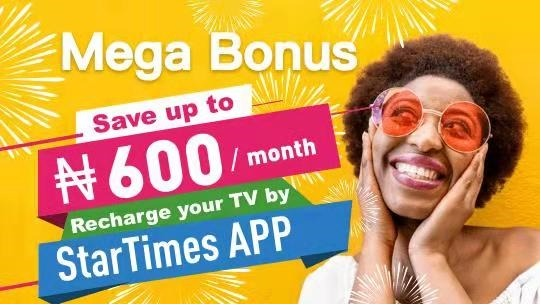 Go ahead, download the App >> https://t.co/aZU454rTALnow and get more value.#StarTimesCares #PayLessForMorepic.twitter.com/jRsZIXDVRM— StarTimes Nigeria (@StarTimes_Ng) December 28, 2018StarTimes ON Mega Bonus is an opportunity for the users to save up to N600 when they recharge their StarTimes decoder using StarTimes ON app. This means, to benefit from the offer, you need to recharge your decoder using the StarTimes ON app. StarTimes ON is StarTimes' official App providing video streaming service of 100+ LIVE TV channels, exclusive LIVE football matches (UEFA Europa League, ICC, 2018 FIFA World Cup Russia, Bundesliga, Ghana Premier League) and online videos, catch up, short videos, plus TV guide of all 400+ channels on StarTimes’ digital TV platform.